Because of intense storm winds in Crystal River, roofs often sustain damage. Wind gusts often exceed 50-70 miles per hour during a storm, causing uprooting of trees and airborne branches. Storm winds in Crystal River can result in devastating damages to your Crystal River roof, such damaged shingles, flashings or even penetration from trees and flying debris. Roof Damage in Crystal River from Storms? A Crystal River Hail Storms: A Roof's Worst Nightmare! Once a severe storm strikes and winds threaten, the updrafts of the wind can cause hail to form. Dirt and dust particles are carried upward, causing tiny balls of ice to form. When a Crystal River hail storm hits, your roof and/or siding on your home can be effected. Hail damage in Crystal River roofs can cause punctures, rips and tears. Hail can pelt your windows and your siding, leaving holes or punctures. Weather is unpredictable. Contractors should not be. 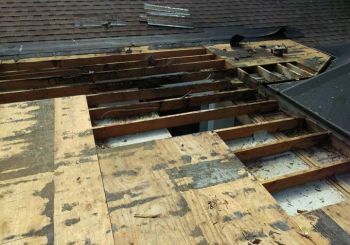 Finding a Crystal River roofing contractor to repair storm damage doesn't have to be difficult. The professional roofers here at P.J. Roofing, Inc have been securing homes and repairing roofs after storm damage in Crystal River since 2003. When a storm damages your roof in Crystal River with high winds and/or hail, you need a competent roofing contractor on your side. Let P.J. Roofing, Inc take care of your damaged roof. With over 16 years experience in repairing Crystal River roofs after storm damage, P.J. Roofing, Inc has been providing reliable Crystal River roof repair that you can count on. Our fast response time to a storm disaster in Crystal River helps minimize any further damage to your property and helps keep the repair costs down. Our Crystal River roofing team at P.J. Roofing, Inc will assess the damage and provide a written estimate for repairing your roof to its pre-damaged condition. P.J. Roofing, Inc has been providing exemplary roofing repairs for Crystal River storm damaged properties for over 16 years. Call (352) 325-8385 for professional service and quick response!